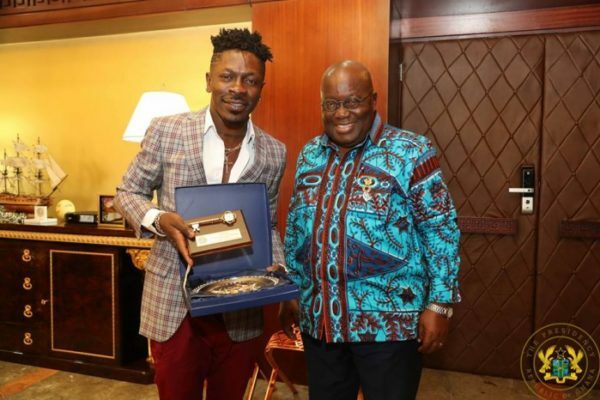 Dancehall star Charles Nii Armah Mensah popularly known as Shatta Wale said President Nana Addo Dankwah Akufo-Addo is his guy. Shatta in an interview on the ‘Total Showbiz’ segment of Okay FM’s “Ekwansodwoodwoo” drive time said, “Right now the President is my guy, he is my guy! Call him and when you call him you can even speak pidgin with him”. 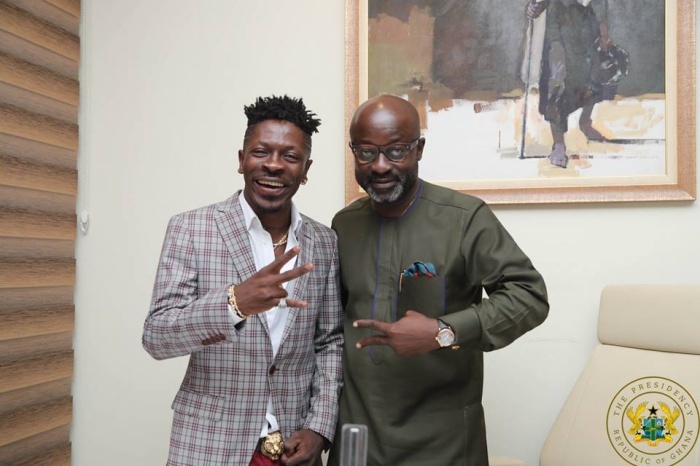 The “Taking Over” hit maker visited the Presidency Wednesday November 1, 2017, after the President extended an invitation to him, on his birthday. President, Nana Addo Dankwa Akufo-Addo on Tuesday October 17,2017 night took to Twitter to wish Shatta Wale a happy birthday in Pidgin English. The viral tweet also sent an invitation to the Shatta Movement leader to visit the seat of government. President Akufo-Addo tweeted: “Happy birthday @shattawalegh! You for come visit me for Flagstaff House o!” and Shatta has finally honoured the president’s invitation. 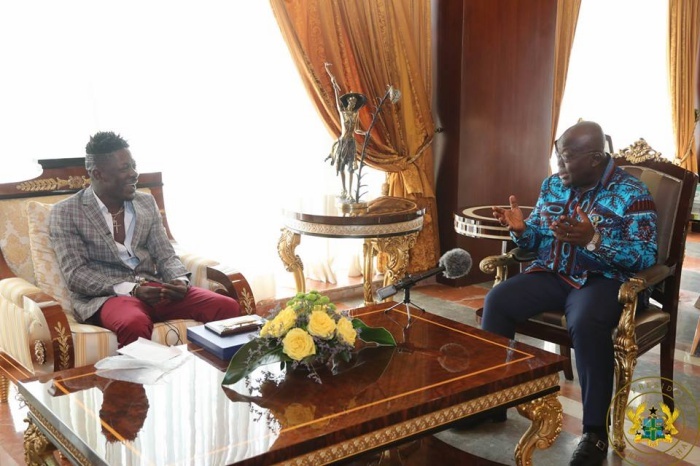 Shatta Wale also mentioned in the interview that he told the President to support and help grow the music industry and creative arts sector in gerenal, when he had an opportunity to speak personally to the president during his visit. 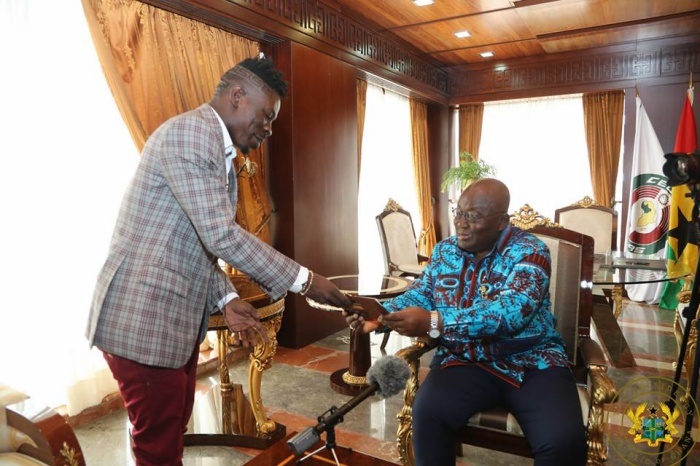 Ghana’s “Dancehall King”, Charles Nii Armah Mensah, popularly known as Shatta Wale, was at the Presidency this afternoon to visit the president, after the President extended an invitation to him, on his birthday. 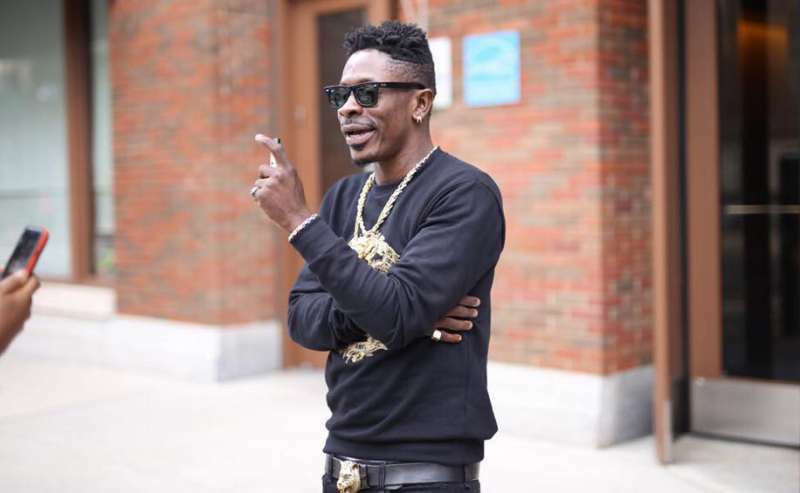 The President, Nana Addo Dankwa Akufo-Addo on Tuesday October 17,2017 night took to Twitter to wish Shatta Wale a happy birthday in Pidgin English. 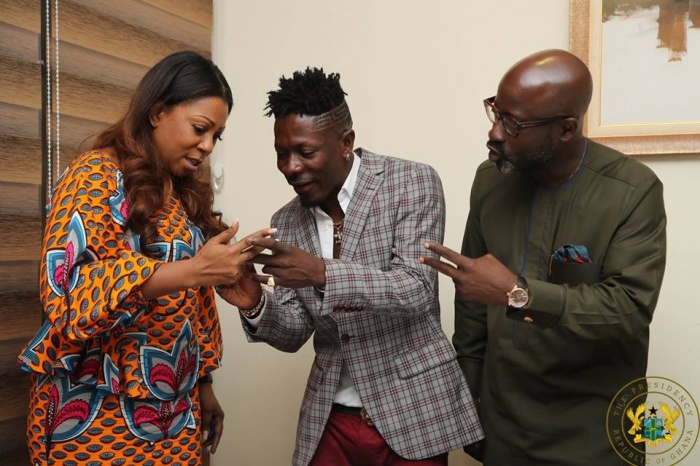 The viral tweet also sent an invitation to the Shatta Movement leader to visit the seat of government. 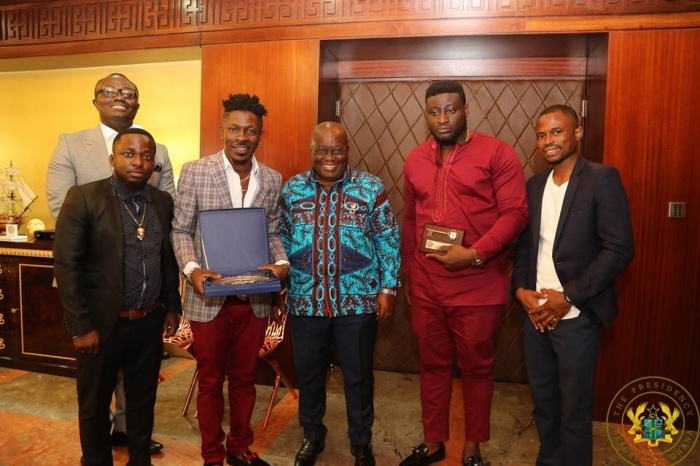 The “Kakai” hit maker aside having personal interaction with the President, also used the opportunity to present to the first gentleman of the land the key to the City of Worcester, Massachusetts, which was given to him by mayor of Worcester Joseph Petty. The key was given to him in July this year for his contribution to the music industry and for honoring the city of Worcester with his presence. The key gives the Dance hall King the rights and privileges of a freeman of the city. 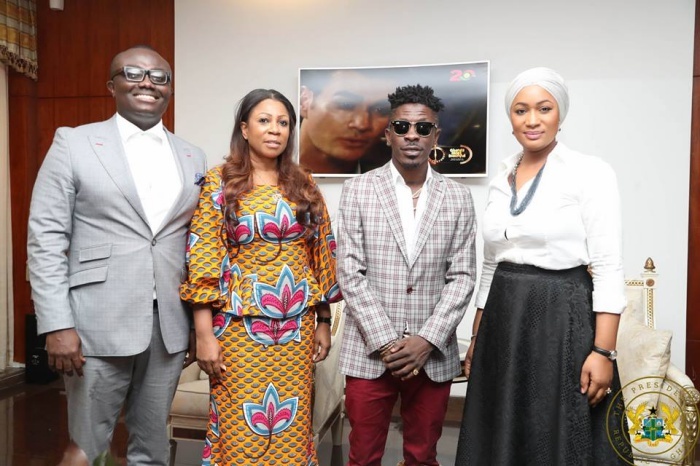 Shatta was accompanied with CEO of EIB Group – Bolaray and some members of his management team. 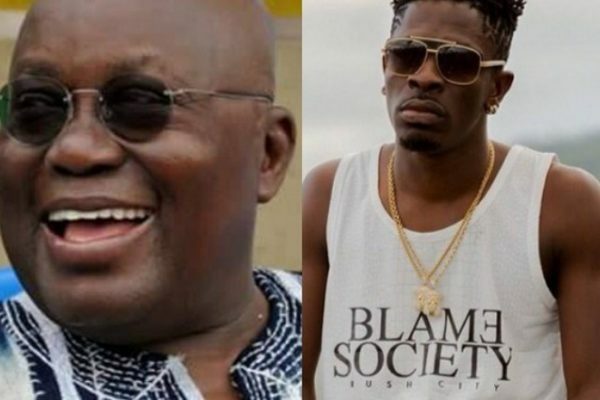 The President, Nana Addo Dankwa Akufo-Addo on Tuesday night took to Twitter to wish popular dancehall musician, Shatta Wale a happy birthday in pidgin English. President Akufo-Addo tweeted: “Happy birthday @shattawalegh! You for come visit me for Flagstaff House o!”. Shatta had last Friday tweeted at the President to inquire about which gift he will be receiving on his birthday. 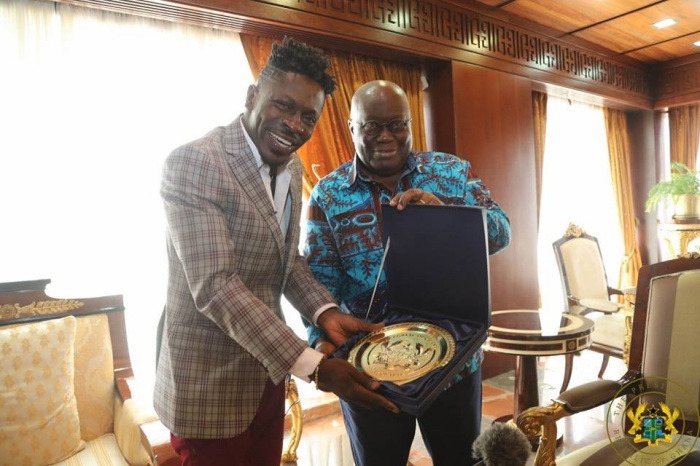 Although the President’s tweet did not directly respond to Shatta’s request, a trip to the Flagstaff House may just be an ideal gift for the controversial musician. 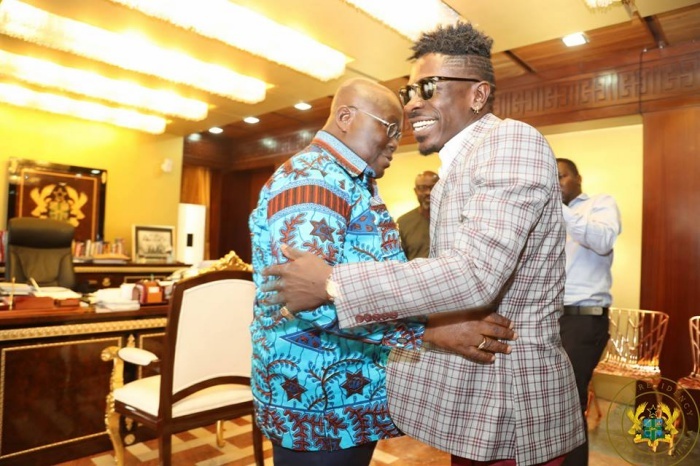 President Akufo-Addo, whilst leading the New Patriotic Party (NPP) in opposition in 2016, revealed that he is a big fan of Shatta Wale. His party, the NPP also used one of the artiste’s hit songs “Kakai” at their manifesto launch that year. 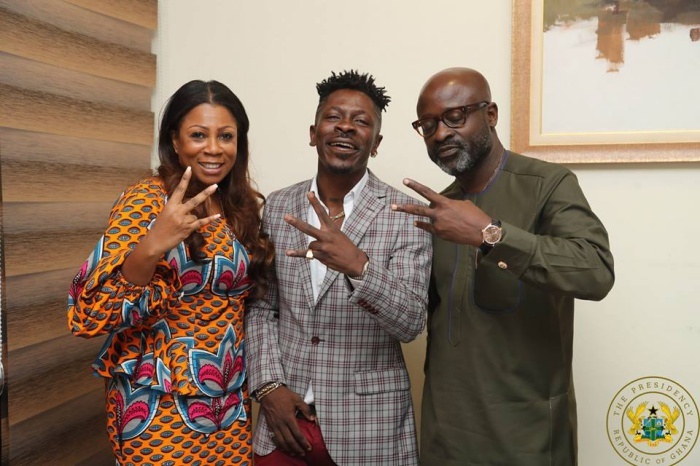 However, the artiste had earlier served notice that he will not endorse any political party ahead of that year’s general elections in December. 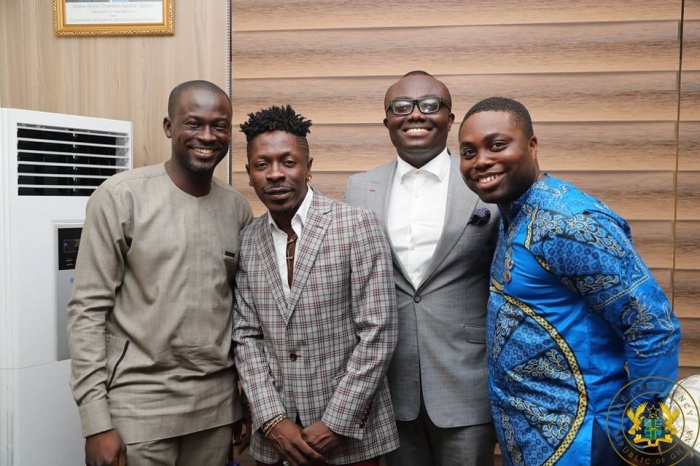 Many Ghanaian celebrities including Flowking of Bradez fame and BET award winner, Stonebwoy have also shared photos of Shatta Wale with lovely happy birthday captions. President John Dramani Mahama’s eight-year-old daughter has written an emotional letter to console her dad after he lost the 2016 elections massively to Nana Addo Dankwa Akufo-Addo. In a hand-written letter, Farida Gyamfua Mahama stated how she still has faith in father in spite of his defeat, how hard her father has worked as President, she assured her father of her love and urge him to take heart and move on after he exits the presidency come January 2017.
he has done soo many things schools, roads. He has done all the things he needs to do and not to say even more. He has done his best and that is the most important thing. I love my daddy and God loves him too and he loves me too and he loves God too. Farida who is President Mahama’s last child, she is a student of Ghana International School at Cantonments in Accra. She is currently President Mahama’s favorite child, as she is seen almost always seen with the first gentleman of the land at home and even during official assignments. When President John Dramani Mahama’s mother died in June this year, he revealed that his eight-year-old daughter Farida, made him smile when she tried to console him on the loss of his mother, Hajia Fatima Abiba Nnaba. President John Mahama also attended Farida’s her speech and prize giving day at the Ghana International School at Cantonments in Accra. Farida topped her class in mathematics and received a certificate of achievement to show for it. The president took his eight-year-old daughter, Farida, to the commissioning of 50 brand new buses for the Intercity STC in Accra some weeks ago. During President Mahama’s official speech to concede defeat on Friday December 9, 2016, Farida was right by her father’s side. Ghanaian Highlife living legend Abrantie Amakye Dede aka “Seeerious” has been spotted on a political platform. The “Iron Boy” hit maker who has not really disclosed his political affiliation in previous elections have been spotted openly campaigning for opposition leader and NPP flag bearer Nana Addo Dankwa Akufo-Addo. As part of his “Arise for Change” tour Amakye reportedly joined the 2016 presidential candidate of the New Patriotic Party, Nana Addo Dankwa Akufo-Addo, to address residents of Agogo, in the Asante Akim North constituency. According sources when Amakye Dede mounted the stage he asked the people of Agogo where he hails from, to vote for NPP to put in place measures to ensure that the ‘Fulani menace’ in the area is curbed once and for all. Actor John Dumelo has emphatically stated that New Patriotic Party (NPP) flag-bearer Nana Akufo-Addo can never be President of Ghana. “I have nothing against Nana Addo, but I only see one person being sworn in come January 2017 and it’s not him(Nana),” Dumelo tweeted to his fans. 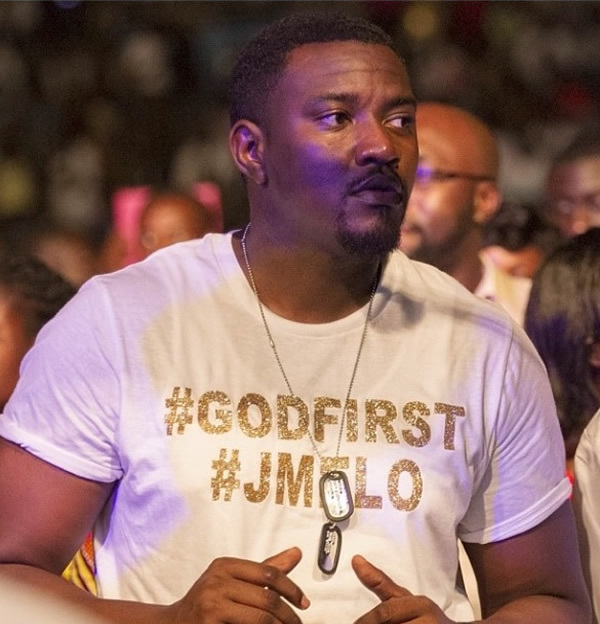 Dumelo endorsed President John Mahama in the lead of to the 2012 general elections. 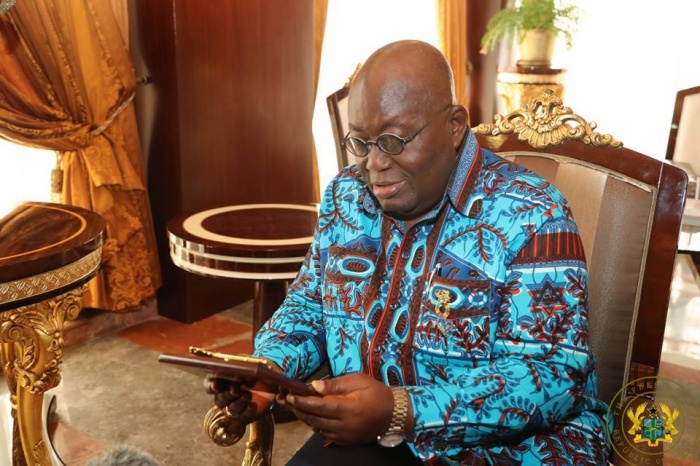 Last year, he also defended the President’s handling of the economy by saying: ‘Rome was not built in a day’ so Ghanaians should give the President the chance to govern. John Dramani Mahama and Nana Addo Dankwa Akufo-Addo will be facing off for the second time in the general election come November this year.